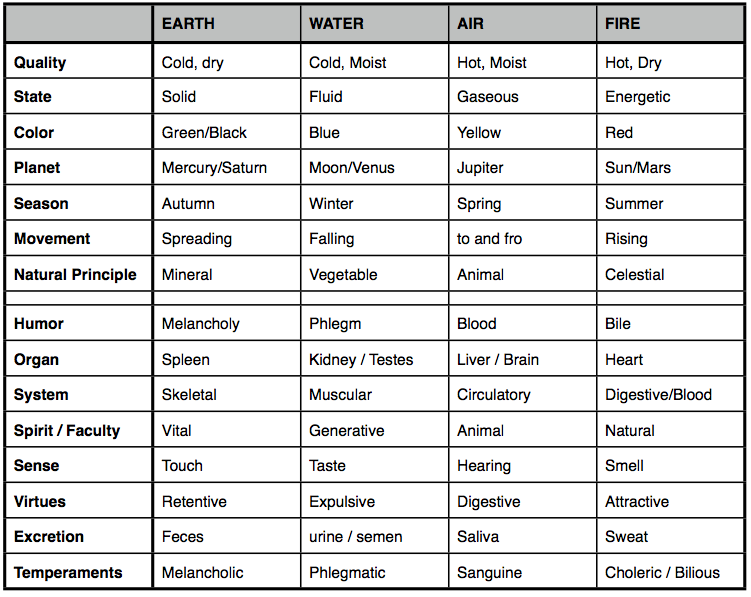 The Western Medical Tradition is based on the Four Element theory. The Four Elements are composed of the Four Qualities of of Hot, Cold, Dry and Moist. Each Element is composed of two of the Four Qualities. Hot and Cold are the Primary Qualities which are represented by Fire (Hot and Dry) and Water (Cold and Moist), analogous to Yin and Yang of the Chinese Tradition. The remaining two Elements of Air and Earth are secondary, in that they each containing Qualities of Fire and Water (Earth is Cold and Dry, Air, Warm and Moist). Right top: the Celtic or Equal-armed Cross is associated with the 4 Directions and the 4 Elements. In addition, the intertwining knot-work represents the interrelation of the Elements and their connection to one-another. Right bottom: the 4 Elements are also depicted in other traditions such as Tibetan. Qualities: Cold, Dry, Heavy; its primary function is Solidity and Form. Plato said Earth has the qualities of Darkness, Thickness and Quietness. Of the Planets, the Earth is most of an Earthly nature (some added the Moon). The Earth also represents balance of the 4 Qualities, as a certain balance is necessary for Life. Earth governs heavy and dark Metals and Minerals such as Lead. Of Plants, the roots are most Earth-like. Among Animals, all creatures which dwell under the Earth, as Worms and Moles, and of Animals, the Bones are most Earth-like. Of the Humors of Man, Melancholy is of the Earth. Of the Soul, the Senses are most Earth-like. Of the senses, the Feeling of the whole body is governed by the Earth, and in disposition, a melancholic nature with a slow and definite motion. By it all things are mortified and reduced to nothing’. Quality: Cold and Moist. Associated with Motion, and the Liquid form. Of the Planets, Saturn, Moon and Mercury were considered Watery (although Saturn is also associated with the Earth). The Moon is the archetypal Water Planet. Plato said Water has the qualities of Darkness and Thickness (from Water), and Motion (from Fire). It is said that ‘Water has especially life-giving power’. Water sustains all life, and promotes generation, as the seed of man is waterish, and the seeds of plants require moisture to germinate. Moses said only Earth and Water can bring forth a living Soul. Water is also responsible for spiritual regeneration, which even Christ noted. Water is essential in Worship of God, and for purifications. Agrippa said ‘... all things subsist, are generated, nourished, and increased’ by Water. Metals are of the Element water, as can be seen when they are melted; Mercury is especially under Water as it is liquid at room temperatures. Gems which are transparent (such as Crystal and Moonstone) and those found in the Water (such as Pearls) are from the Water Element. In plants, the leaves are most under the Water Element, as they most abound with water; further, plants which grow in water, or in damp places, and those which have most cool juice are classed under Water. In animals, most fishes and animals living in water are also associated with Water Element. In man, the Phlegm Humor represents the Water Element, although in general, the Water Element governs all the Humors. Of the Soul, the Imagination is most Water-like. Smell and taste partake of the nature of Water (without Water there is no smell or taste). Of the disposition, Water signifies Fearful, sluggishness and carelessness. Air is relatively Light, being Hot and Moist. It is associated with the ability for Extension, and the ability to assume a gaseous form. Of the Planets, Jupiter and Venus are attributed with Airy qualities. Plato said Air has the qualities of Thinness and Motion (from Fire), and Darkness (from Earth). Air represents the Vital Spirit [Qi] which passes through all things, gives life, and causes movement in all things. The Air element receives and accepts influence of the Planets and Heavens, and is responsible for communicating them to the other elements. Air carries the feelings and memories of people, places and things, and can convey them to others. So a sensitive person may rightly become fearful when walking through a place where someone was killed violently, as the Air conveys this to them. It is by this faculty that Air moves the mind to various types of thought, emotions and dreams (and this is why medicines which calm Air/Wind are used for various mental disorders). Air also has the quality of binding, and it is for this reason that the ancient Hebrew Philosophers didn’t count it as an Element, but rather as a unifying substance or glue which bound things together. This is very important, as the Air or Wind of the Vedic texts (Vata) was accounted as Cold and Dry for this reason, as opposed to the Galenic view of Air being warm and moist. Air and Wind are closely related; as Agrippa points out, Wind is only Air that is moved. The Air Element directly governs Plants, especially the flowers, because of their subtlety. Tin and Copper (as well as being related to Water and Earth) partake of the nature of Air. Among stones are those which float upon the water, notably Sponge stone (the stone from the center of a sponge) as well as Pumice stone; other light stones also partake of the Element of Air. In Animals, are birds and other creatures of the Air, and of Animals the Flesh. Of the Humors of Man is the Blood governed by the Air, and of the Soul, the Reason. Of the Senses is the sense of Hearing (which is carried through the Air). As for the disposition, Air causes cheerfulness, and a happy disposition. and everything that lives, lives by reason of the enclosed heat’. Fire is Hot and Dry. It gives Force, Energy and Intensity. Of the Planets, Sun and Mars are of the nature of Fire. Plato said Fire has the qualities of Brightness, Thinness and Motion. Fire has the effect of warming, giving life, and promoting fruitfulness. It drives away the Spirits of Darkness, and promotes the Spirits of Light. It is for this reason that Candles have long been burned during various religious ceremonies in all great religions. Fire particularly governs all Animals, and of them, especially the Vital Spirits. Minerals under the government of Fire include Flints and Pyrites from which Fire may be struck, Arsenic, Asbestos and Sulphur, and the Metals Gold and Iron. Plants of hot and dry climates, especially heating spices, and of plants, the Seeds are most under the domain of the Fire Element (as they most multiply the Spirits). Amongst beasts are Lions, and the mythical beasts Dragon and Salamander. Within Man, the Vital Spirits are ruled by Fire, and of the Humors, Bile. Of the Soul is the Understanding most Fire-like. Of the Senses, the Eyes (the sight requires fire and light to be perceived). Of the disposition of the Man, a quick, fierce, bold and angry nature are of the Fire Element.